Ariri Samariri uses mainly -ga based attacks in various forms. Theese need to be stuned. Well worth knowing is he also build a high cumulative resistance to stun. 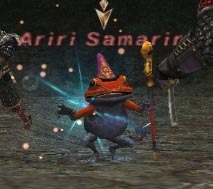 So it is important to kill him fast - This can be tricky though since another "peculiar" thing about Ariri Samariri is that damage dealt to him will keep geting less as his HP depleats. Prepare for a long fight, made as short as possible. Frog Song - Single-target Charm and turns target into a Frog. Sleep person hit. Frog Chorus - Charmga and turns all it hits into a Frog. Sleep the ones hit. Providence - Haste; Breakga, Bindga, Blindga, Graviga, Slowga, Death, only used when Providence is in effect; cannot be dispelled. Magic Hammer - Single-target light based magic damage and MP drain effect equal to damage dealt. Ignores shadows. Water Bomb - 10' AoE water damage (the 10' is not counted from Ariri Samariri, but is counted from the initial target for the ability) with a added Silence effect. This move also reset all hate. Ariri Samariri will after use of this move target a completely different person at random. In addition to this s/he also use all elemental -ga 3 spells. Mages try and stun theese in particular. All elemental spells do roughly half damage to him.